Here’s something I’m super excited to be a participant in. 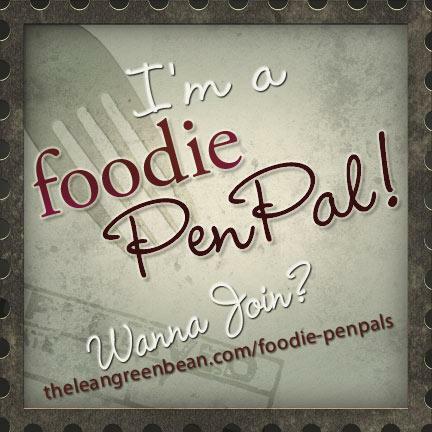 Lindsay from The Lean Green Bean created an AMAZING program–Foodie Penpals. It’s a great way for foodies all over the country (now in Canada and Europe too!) can share their favorite foods and maybe even discover some new favorites. The program started a little less than a year ago with about 3o participants and now has over 1,000! The way it works, is kind of a triangle format. You send to one person and receive from another. This month, I sent some goodies over to Rachel at the Health Revival and received a tasty package from Kelly at Cupcake Kelly’s. For my first Foodie Penpal experience, I have to say, Kelly made me VERY glad I joined this program! 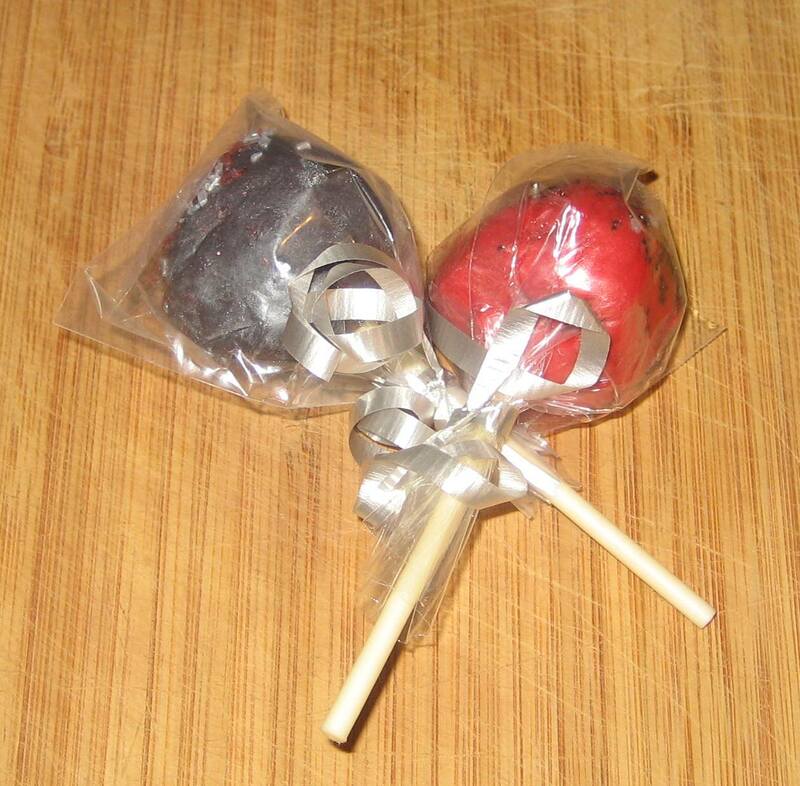 First up were homemade cake pops–chocolate with red icing and red velvet with chocolate icing. She send me 4, but my husband and I devoured the first pair pretty quickly. She noted they were staples at her family parties. Here’s hoping I’m invited next time! Another homemade goodie was baklava that Kelly and her mother-in-law made. Her in-laws are 100% Greek, so I was excited. Now I have to admit, baklava isn’t exactly my favorite dessert. I’ve had far too many overly sweet versions that I generally avoid it. But THIS. Kelly’s baklava wasn’t overly sweet. It was rich and nutty and oh so moist. Next, some of her local favorites. 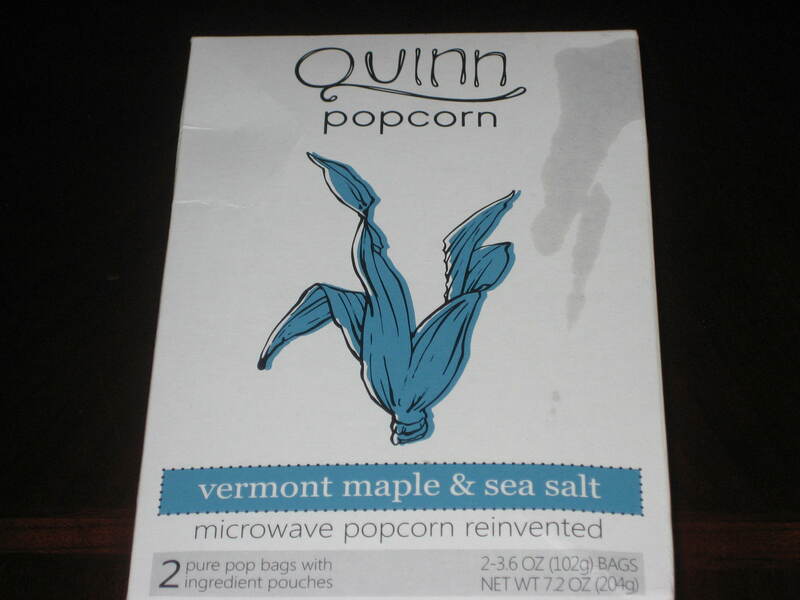 Quinn’s popcorn, a brand I have never heard of, was fantastic. Maple and Sea Salt–what a combo! It was microwavable popcorn but unlike any I’ve ever had. First you pop the corn, like usual. It’s actually plain at this stage, so there’s no artificial buttery elements or flavors. Next you open the top of the popcorn bag and pour in packet 1 (canola oil). Shake, shake, shake! Then you add the second packet of maple sugar and sea salt. Shake, shake, shake again! Popcorn with a workout! Pour into bowl and enjoy (quickly! or someone might eat it all–in this case my husband). Maple & Sea Salt Popcorn? Yes please! 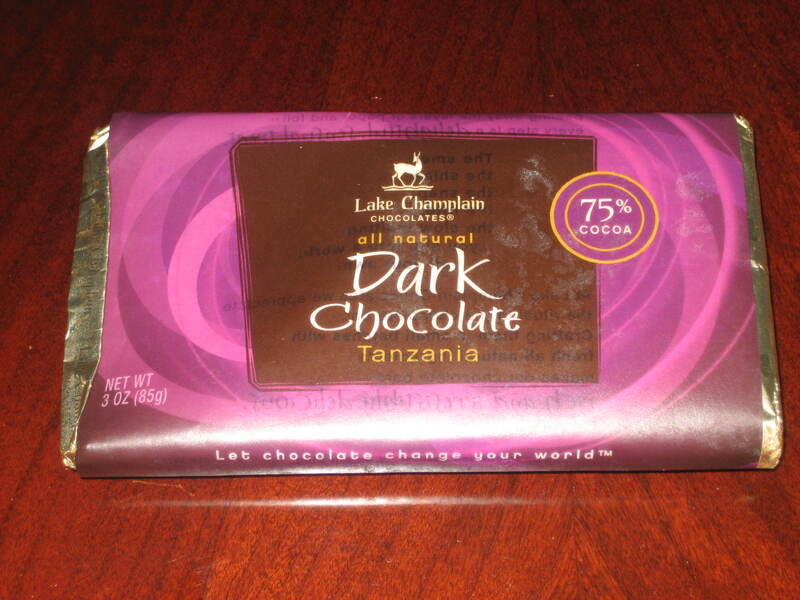 Lake Champlain dark chocolate. She must have been reading my blog to know how much I LOVE chocolate! Now, it didn’t exactly travel well (which makes me nervous since I send chocolate to my penpal too!). It must have melted a bit during transit, then re-hardened when it arrived because when I picked up the bar, most of it was crammed into one side of the package. But trust me, it still tasted wonderful, which is really all the matters. 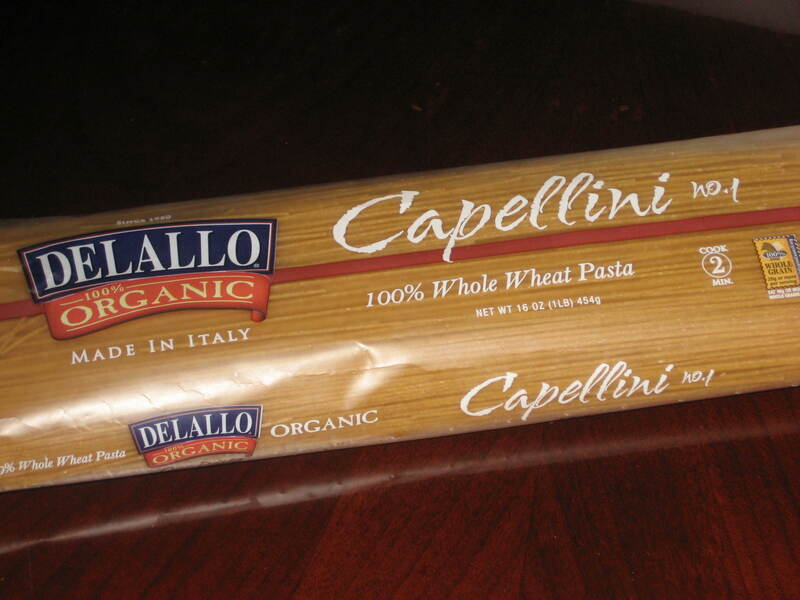 And finally, Kelly sent me some of her favorite pasta (which happens to be one of my favorite brands too! Now I just need to find a good recipe for it. One of my favorite pasta brands too! I’m thinking Carbonara? And there it is. 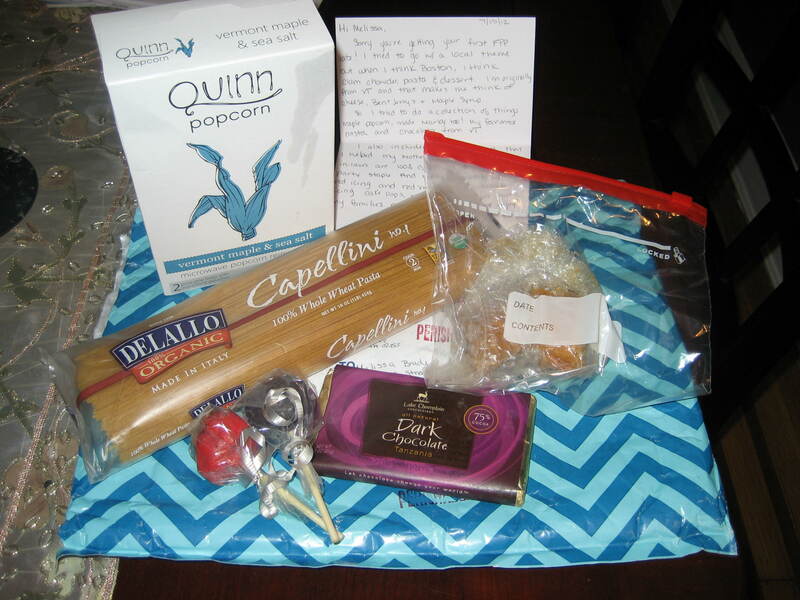 My July Foodie Penpal package. Such a great program. Not only do you get to send and RECEIVE tasty foods, but you’re also exposed to tons of other foodie blogs, just like your own. BONUS: you don’t have to be a blogger to participate, readers can join too! Foodie Penpals is open to US & Canadian residents. Please note, Canadian Residents will be paired with other Canadians only. We’ve determined things might get too slow and backed up if we’re trying to send foods through customs across the border from US to Canada and vice versa. If you’re interested in participating for July, please CLICK HERE to fill out the participation form and read the terms and conditions. You must submit your information by July 4th as pairings will be emailed on July 5th! Oh, it was. That and the cakepops didn’t stick around for too long! Hi Melissa! Wow, you got some serious goodies — love the popcorn “assembly” 🙂 Thank you again for all the wonderful foods you sent my way. Too much fun, seriously…can’t wait for August! Oh my gosh, baklava. I used to work for a Greek family in their restaurant, and I’ve never had better Greek food anywhere. I’m so jealous right now. I have pretty good Greek food in my neighborhood, but not like this. 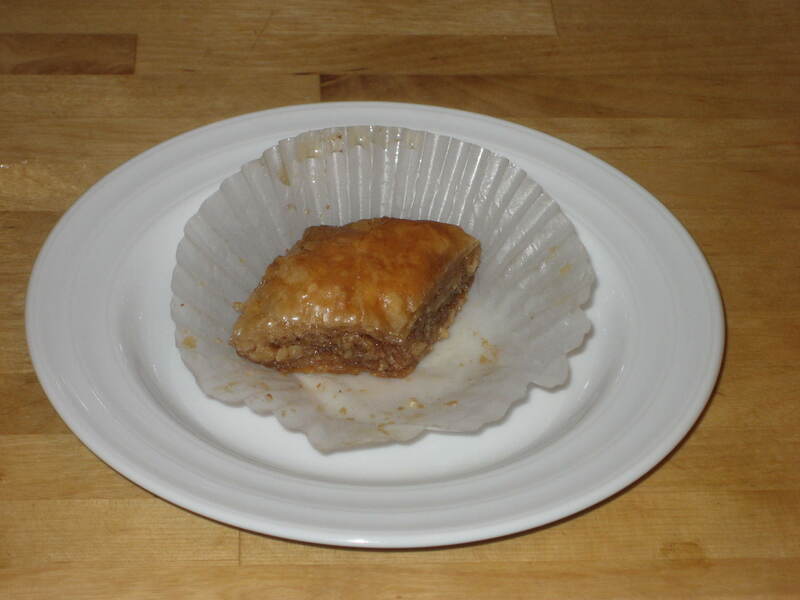 I never imagined baklava could taste so good!